Introducing a team of robots powerful enough to change the world--and yet smaller than the dot at the end of this sentence! A boy inventor creates the ultimate in high-tech superheroes that could one day save the world--but they have some smaller problems to take on first! NanoBots are tiny. They're almost too small to see, but they can each do a unique and important job: Medibot makes sure their Inventor never catches a cold.... Chewbots gobble up that gum the Inventor trampled into the carpet... Binobot scans the scene of a crime for clues the Inventor could never see... and Seekerbots explore to meet microscopic new creatures. 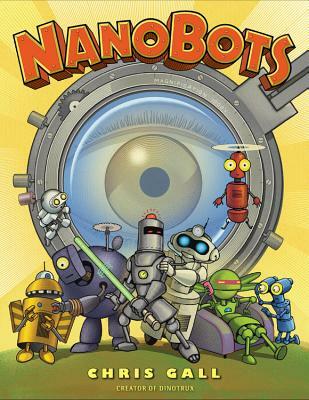 These bots and their high-tech friends sure make the inventor's life easier, but when the most AWESOME robot in town is in real trouble, they must band together and prove that sometimes the SMALLEST helpers can be the BIGGEST heroes! Includes fun facts about real nanotechnology in the backmatter.